At the southern tip of Cuba, along a rocky, wind-battered coastline, lies Camp Omega. Here, prisoners of war are beaten, tortured, and brutally interrogated, all in the name of protecting the interests of the United States of America. Sound familiar? It’s no accident that this grim place draws close parallels with Guantanamo Bay. Despite its obvious fetishism for weapons and the military, the MGS series has always been anti-war, and this is writer/director Hideo Kojima’s most provocative statement yet. Prisoners in orange jumpsuits, black bags pulled over their heads, cower in cages as rats scurry around their feet. Spotlights shine from towers through pounding rain, always watching. Armed guards, who seem almost as miserable as the detainees, patrol the base, their raincoats billowing in the howling wind. It’s an overwhelmingly bleak, but powerfully evocative setting—and it’s the centrepiece of Ground Zeroes, a single-level prologue to the forthcoming Metal Gear Solid V: The Phantom Pain. You are Big Boss, a legendary soldier and former CIA operative who, after being betrayed by the US government, forms his own private army. Two prisoners are being held captive in Camp Omega, and he needs them alive. This, like previous entries in the series, is a stealth game. Ideally you’ll want to sneak into the base, extract the prisoners, then escape without alerting anyone. But that’s just one of many ways to complete the mission, and it’s this freedom that makes Ground Zeroes worth spending money on, despite the fact that, at first glance, it seems to be little more than a demo. You’ll see the credits roll and you’ll think, is that it? But then you go back to the main menu and notice that you’re at 8% completion. Clearing the main mission unlocks four more that alter the camp’s layout, enemy patrol patterns, weather, and time of day, creating an entirely new set of challenges. In one mission you have to identify and assassinate two war criminals. Another sees you destroying anti-air guns to pave the way for an airstrike. They might not sound that interesting on paper, but it’s the sheer number of ways to approach each objective that makes Ground Zeroes special. While Metal Gear Solid games are typically story-heavy, the focus here is squarely on the stealth. Except for intro and outro cut-scenes—the former of which makes atmospheric use of a Joan Baez protest song, reminding us of the game’s 1970s setting—all of your time in Camp Omega is spent playing. It’s a remarkably detailed, interactive world, filled with ways to evade, distract, or subdue enemies. Big Boss prepares to infiltrate Camp Omega. The small army of Marines who guard the base feel like people, not automated drones. There’s an impressive amount of reactivity, and they respond to suspicious noises or malfunctioning security cameras with a mixture of curiosity and trepidation. If the alarm sounds, they’ll work together intelligently to surround you and pin you down. They follow set routines, but sometimes they’ll surprise you by suddenly looking over their shoulder or sneezing, giving you a split second to dash safely past. How you reach the prisoners and carry them to safety is left entirely to your imagination. A deep ranking system rates your performance based on how quickly, quietly, and efficiently you complete the mission, and you earn extra points for things like not killing anyone or not triggering any alarms. You can dumbly charge through the majority of the game with your guns blazing, but the fun (and challenge) lies in learning the map, exploiting the systems, and outsmarting the AI to get the best possible score. It’ll take you a while to achieve the ultimate S rank on every mission. On my GTX 970 (4GB) review PC, the game maintains a solid 60fps on ‘extra high’ settings at 1080p. On my HD 7850 (2GB) at home, I had to knock it down to ‘high’ to achieve the same frame rate. I tested the game in 4K using a Samsung U28D590D UHD monitor, and while it looked impressively sharp, the dip in FPS wasn’t worth it. Overall, this is a great port. Kojima Productions’ new Fox engine was designed with PC in mind, and it shows. Minor object pop-in aside, I had no issues with crashing, frame drops, bugs, or anything else. It ran perfectly on both my work and home PCs. The camp is big, and a testing ground for The Phantom Pain’s open-world stealth, which is a first for the MGS series. But it’s small enough that, after a few hours, you’ll have a fairly accurate map of it in your head. It’s a brilliantly designed space, and fifteen hours in, I’m still finding new ways to navigate it. There are vents to crawl through, walkways to sneak across, towers to climb, and roaming trucks to hide in the back of. It’s as rich a systems-based stealth game as Deus Ex, minus the RPG elements. Ground Zeroes is, really, a proof of concept for a newer, more modern take on the series’ established stealth. It retains that distinct Metal Gear Solid feel, but with tighter, more responsive controls. Anyone who played the old games will recall the pain of wrestling with the clumsy three-step stand/crouch/prone button. Mercifully, this is gone, and you can now transition seamlessly into a crawl/crouch from a run/walk. Push up against a vertical surface and you’ll lean into it, allowing you to peek over to tag guards. It’s the first Metal Gear game where movement actually feels intuitive. By confining you to this single, focused space, the game lets you really drill down into its systems. Learning and mastering its intricacies is deeply satisfying, if you’re willing to put the hours in. The controls are still slightly idiosyncratic in places, though. You have to play Twister with your fingers to simultaneously hold a guard up and interrogate him, for example. But this is part of the deal in a Kojima game. The mouse and keyboard controls are fine, but like all third-person games, you’ll benefit from using a pad. It’s clear the game has been designed with a controller in mind, and the analogue stick is used to control the speed of Big Boss’s movements. Nudge it slightly and you’ll almost tip-toe, which is essential for creeping up on guards without alerting them. You can achieve the same effect by holding the control key, but it feels more intuitive using the stick. The rain-slicked cliffs that line the edges of the camp are a perfect vantage point for scouting before you begin your infiltration. Using zoomable binoculars you can tag enemies Far Cry-style, and a directional microphone lets you listen in on their conversations, revealing clues about where the prisoners might be being held. It pays to be methodical, as tagged guards will be permanently marked by a HUD icon, even from a great distance. This is useful, because the large, open nature of the map makes keeping tabs on every guard and the direction they’re facing basically impossible. But, inevitably, you’re going to get spotted. If a guard catches a brief glimpse of you, he’ll come and search your last known position, radioing his commander to say he’s seen someone suspicious. In this situation it’s best to let him finish and report back with the all-clear before you take him out, otherwise more soldiers will be sent to investigate. At night they’ll shine their torches at any unusual movement they see, which can expose you. On normal difficulty you can linger in an enemy’s line of sight, from a distance, for a good few seconds, but they’re much more perceptive on hard. Raiden makes a strictly non-canon cameo appearance. It’s when the enemy gets a good, long, uninterrupted look at you that they’ll enter combat mode, telegraphed by an exclamation mark above their heads and a shrieking brrring sound that Metal Gear Solid fans will be all-too familiar with. This will put the entire base on alert, and your best option is to run and hide. You can fight back, but reinforcements will arrive if you start getting trigger happy. Generous checkpointing lets you return to an earlier state if you mess up, but this will affect your final score. Evading and adapting is the most enjoyable way to deal with an alert. Sneak up on an enemy and you can interrogate them, either by grabbing them or holding them up and demanding they drop their gun. They’ll reveal the locations of hidden weapons and tag nearby enemies for you, then you can choke them unconscious or execute them with your knife—but make sure you hide the body. Stunned enemies will eventually wake up and sound the alarm, so it’s best to fire a tranq dart at them before you move on. They’ll also mark XOF patches on your map, nine of which are hidden around the camp. They’re worth finding, because they unlock two very silly bonus missions—Deja Vu and Jamais Vu—that have been designed with fans in mind. These were previously PlayStation and Xbox exclusives, but on PC we get both. Deja Vu sees you recreating key scenes from the Shadow Moses Incident from the first Metal Gear Solid. It’s a shameless parade of callbacks and easter eggs with a quiz at the end. If you’ve never played the game, you’ll find it all a bit confusing. But if you’re a fan, the snow and howling wolves will make you misty-eyed with nostalgia. Then there’s Jamais Vu, which sees you playing as Raiden from Metal Gear Rising: Revengeance. Body-snatching aliens have disguised themselves as guards around the base (a reference to early Kojima game Snatcher), and you have to identify them with your binoculars and kill them. Raiden controls identically to Big Boss, although he sprints at twice the speed. Sadly, his high-frequency blade is nowhere to be found. With the iDroid you can call in a chopper to extract you. These missions are just extras, really. A bit of irreverence to lighten the game’s otherwise dark tone. The meat is in the main mission and side ops, which took me 8 hours to complete. You might balk at the idea of paying almost £20 for a single level, but trust me: there’s a lot in here. With just one location, it’s deeper and more varied than games some publishers would charge £50 for. If you like challenging, open-ended stealth that lets you flex your imagination, you should seriously consider giving it a go. And don’t worry if you haven’t played a Metal Gear Solid game for years, or ever for that matter: there’s a backstory option on the main menu that will get you up to speed. Or you can read my beginner’s guide. 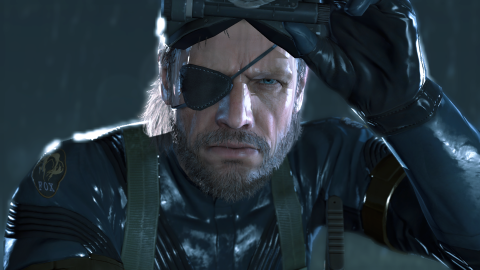 Metal Gear Solid has been absent from PC for far too long, and this is a hell of a comeback. Now I just have to come to terms with Kiefer Sutherland replacing David Hayter as the voice of Big Boss, but I'm getting there, one day at a time.